This long and complicated project installing three magnificent fireplaces, took place in a new build in Kent. It delivered stunning results for the client. The client was building a fabulous house and needed three fireplaces for different rooms. 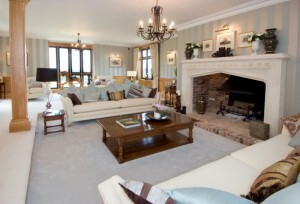 Each fireplace had to create a wow factor in each room. The client’s criteria enabled us to present to them previous images of installations The Billington Partnership had carried out for other customers. With a few detail changes, the client was excited with the choices. 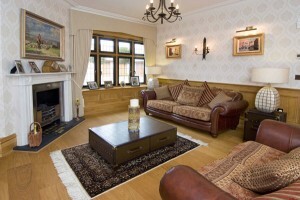 This fireplace had a particularly interesting scenario due to the dining room having a double vaulted ceiling. Most fireplaces would be dwarfed in such a room. 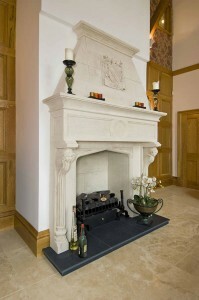 However, the client’s choice for the room was a magnificent limestone chimney piece which stood at over 10ft tall . 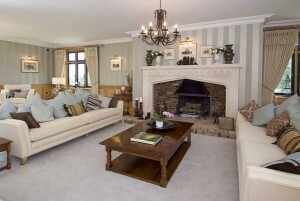 Furthermore, we fitted a large swan basket with gas fire in the extremely large opening. Our craftsmen even copied the family’s coat of arms and managed to carve it into the top section of the chimneypiece. For the hallway of the property, the client selected a very elegant Regency Bullseye surround in a fabulous Persian marble. Also, within the mantel, they chose a wonderful hob grate with a remote controlled gas fire. This truly stunning and grand fireplace can be seen from well before you enter the room. The client wanted a centrepiece, one that would span the enormous inglenook opening that had been created. The beautifully designed brickwork, the mantelpiece and the inglenook all compliment each incredibly well. Furthermore, because there was such a massive opening, we had to install a hood to create the right draw. Also, the fireback was brought in by forklift and a trolley before being manoeuvred into place by five of us due to its size and weight! And to finish off, the swans basket was 36″ wide.